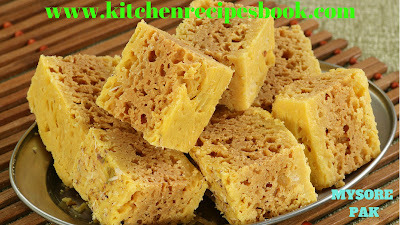 Mysore Pak is the most popular classic sweet which is originated in the kitchen of royal Mysore palace. The aromatic and delicious sweet is prepared using chickpea flour/besan, ghee and sugar.mysore pak also use a little bit amount of oil to get a unique texture. To make this recipe, understanding the method is crucial to getting the perfect texture. 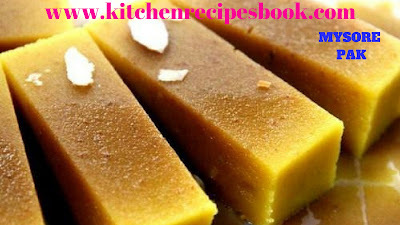 A perfectly made Mysore pak is light, not hard, slightly crunchy, edges with crumbs and a porous texture with a delicious aroma. To get the right texture, the ratio of the ingredients used is most important. This recipe I have shared a small batch that yields about 10-12 medium sized pieces. Pour 1 tbsp ghee to a small tray and rub well for setting the Mysore pak. kept this aside. Place a sieve over a large bowl. Measure and add besan to the sieve. Next sieve it well again. Divide the flour 3 parts and shift them to small bowls. Kept this aside. On one burner of the stove place a kadai and pour oil and ghee. Start to heat it on a low flame to medium flame. On the other side of the burner, place a wide deep pan. Pour the water and sugar. Start to heat it. Boil the sugar syrup mixing often until it reaches a one string consistency. To check the one string consistency of the syrup. take a small amount portion of the syrup in between the fingers. Ensure the ghee and oil are turning hot. Add a 1/3rd portion of flour to the bubbling sugar syrup. Flame must be medium and the sugar syrup bubbling well. Otherwise, Mysore pak turns flat. Mix well until all the flour blends well within the syrup. Next, add a 1/3rd portion of flour. Repeat adding the last part too following the same process. At this position, there must be no lumps and the flour must blend well with the sugar syrup. Then add a full of hot oil and ghee to the pan. Then immediately ghee and oil must sizzle, it's hot enough. Make sure the ghee is really very hot otherwise increase the flame of burner 1 to keep oil and ghee consistently hot. Immediately stir well until all the ghee has been absorbed. Repeat adding the ghee in parts and stirring until the ghee is well absorbed every time. As the ghee is adding every time it has to sizzle.then stir well until absorbed.If you don't have sufficient ghee left in the kadai.then pour 2 tbsp more ghee and oil.then heat it quickly. Quickly pour some amount of ghee and stir.don't add a lot at as it will leave out the excess. When the Mysore pak is ready to finish, the mixture will turn very thick with a lot of pores or bubbles don't add no more ghee at this stage otherwise, it will ooze out the excess. The mixture will leave the pan completely within the fraction of seconds. Be fast and transfer to a greased pan. Level the top with the help of spoon(greased). kept this aside for 10-15 minutes. Invert it on a board. Cut to desired medium sized pieces. Finally, cool Mysore pak store in an airtight jar at room temperature.